LAUSD Superintendent Austin Beutner at the 2018 Alliance’s panel. From left, Layla Avila who is CEO of Education Leaders of Color, parents Taluana Jones and Evelyn Aleman, Beutner, and students Isaiah Schwarz and Angela Saha. Six months after taking over as LA Unified’s superintendent and vowing to bring change, Austin Beutner is weeks away from unveiling his strategic plan for the nation’s second-largest school district. Beutner shared some of his plan’s goals after a parent summit last week at the Cathedral of Our Lady of the Angels downtown, one of the dozens of community forums where he said he has listened to 4,000 to 5,000 parents, educators and community members about their needs for their schools. The heart of his plan is giving more authority and decision-making power to parents, school leaders and teachers to address achievement gaps, improve student learning and provide more resources to schools. Less than half of LA Unified’s students are proficient in reading and math and nearly half its graduates aren’t eligible to apply to a state four-year college. The district, which currently has 486,000 students but is losing about 15,000 a year, is also in fiscal distress and at risk of going broke within the next three years. He said parents and families have been front and center in the development of his “Reimagining Our Schools” plan, which is in its final stage before being presented to the school board in the coming weeks. Families and communities are “the most important if not the most powerful single constituency in public education,” he said. “There’s nothing more important than families being engaged in their child’s education, and truly engaged, so they can help their students and they can hold those who are responsible for their education accountable for making sure we are doing the best possible job,” Beutner told LA School Report after the panel. “LA Unified now has bureaucracy at the center, power at the center, money is at the center. There are no kids, there are not students at the center. So when we talk about reimaging, we’re trying to say, ‘Let’s think about one school and the resources for that school, for that community,’” he said Wednesday. Beutner isn’t the first to try to decentralize the district. Superintendent Ramon Cortines and later his successor, John Deasy, and then Cortines again, pushed for local control. Cortines in 2015 created the current six geographically-based local districts. Beutner also wants to cut through the bureaucracy for parents. “We should never ask you to come to Beaudry,” he said, referring to the district’s headquarters building in downtown LA. “Beaudry shouldn’t be the face of public education.” To boost parent involvement, his plan will reduce the number of forms parents need to complete in order to volunteer at schools and will waive the $57 fee to be fingerprinted. Beutner said the priorities of his plan will be evident in the upcoming school year’s budget. Funding partners for the plan include the Ballmer Group, California Community Foundation, California Endowment and The Eli and Edythe Broad Foundation. The two firms in charge of its development are Kitamba, an organization led by education professionals, and Ernst & Young, which helps organizations find and implement efficiencies. “We have listened to thousands of people, community members at events like this forum, with parents at dozens of organizations,” Beutner said. “And also in a more formal setting in schools with educators, students — overall between 4,000 to 5,000 stakeholders” for their input into the plan. He said his wish is that parents would join LA Unified in advocating for more resources from the state. “You’re the best advocates for your community, so come with us to Sacramento,” he said Wednesday. “If I have one wish, it is that our community, our families, labor partners, our educators, our students come with us. Let’s get in our yellow buses, let’s go to Sacramento to begin a conversation about what our next generation of students need,” he said. Last year, 14.7 percent — or 70,000 — of LA Unified students were chronically absent, meaning they missed 15 or more days of school. That represents a $630 million loss each year in funding for the district. 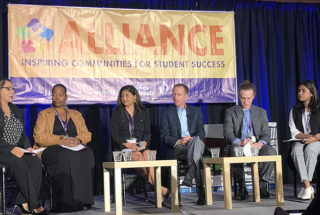 On Wednesday, Beutner joined two LA Unified high school students, two parents and one education advocate on a panel at the annual 2018 Alliance Summit hosted by LA-based parent engagement organization Families in Schools. They had an hour-long conversation on stage about their personal experiences with LA schools before an audience of about 200 people. The panel was held after an awards luncheon, part of the daylong summit that gathered more than 600 people, mostly parents, according to Families in Schools, who attended parent engagement-related workshops and informational sessions. Panelist Evelyn Aleman, who has a child at Grover Cleveland Charter High School and who is a member of the LAUSD Parent Advisory Committee, told Beutner that in order for parents to be engaged they need to first feel welcomed in the schools and in the classrooms. Taluana Jones, another mother on the panel, said safety and social-emotional support for students receiving special education services are urgent issues for the superintendent’s plan to address. “I had to take out my son (from LA Unified) because he was being bullied because of his speech problem, but he tells me that he would love to be back in his public school,” Jones said. Angela Saha, a senior at the medical magnet at Van Nuys High School, said she and other low-income students need more support and guidance applying for college and that there are not enough counselors. “I didn’t know what FAFSA was, how to fill out forms, how to get my tax returns. My family could not help me. I had access to a counselor, but I think that’s not the case for most students. That needs to change,” she told the superintendent. Saha, who is the daughter of immigrants, said she was lost “every step of the way” and she wants many things fixed in the district so she and all LA Unified students can have a real chance at college.